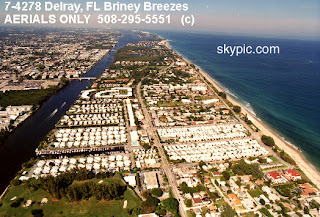 A great article from MSNBC about a waterfront trailer park in Palm Beach County. If they agree to get bought out by a developer, they'll get over a HALF-BILLION dollars for their little 43 acres of paradise. 'BRINY BREEZES, Fla. - The owners of nearly 500 mobile homes in one of the last waterfront trailer-park towns in South Florida stand to become instant millionaires if they agree to sell to a developer. But some are holding out, saying there are things more important than money. Okay - the first question is - what kind of land are they sitting on? 'With 600 feet of oceanfront property and an additional 1,100 feet along the Intracoastal Waterway, real estate like this in southeastern Florida is pure gold. Boca Raton-based Ocean Land Investments has big plans for the property if the deal goes through, as many residents are certain will happen. The company envisions about 900 low-rise multimillion-dollar condo units, a high-end marina and a 300-room luxury hotel. And a view from an owner who wants to "Sell, sell, SELL! Like NOW!". 'Kevin Dwyer, 47, is all for the deal. Dwyer, who paid just $37,500 for his trailer nine years ago, would make about $800,000. Pierson acknowledged that the loss of Briny Breezes means a piece of old Florida will be gone forever. But he said that because of the town’s location on a barrier island, a hurricane could eventually wipe out Briny Breezes. And is this really a good idea for the developer, being on the ocean? 'Palm Beach County Commissioner Mary McCarty is not so sure it’s a done deal because of constraints on zoning, water, sewage and traffic. “I find the developers extremely optimistic to the point of being delusional,” she said. For one thing, the community is in a hurricane evacuation zone and has few ways in or out. Developers will have to clear their plans through the state before any dirt is moved, and neighboring communities will have a chance to weigh in. Finally, a "Happy 2007!" to all our readers and posters. 2006 was a break-through year - let's keep up the fight and make 2007 the year that EVERYBODY discovers the truth about the fantasy of a bubble market. I'M JUST AMAZED THAT A HURRICANE HAS NOT WASHED THEM OUT TO SEA!!!! You've got other ones like that up in Jupiter, and Jensen Beach, in particular, that'll probably go the same route!!!! IT'S RIPE FOR A HURRICANE OR A DEVELOPER.....TAKE YOUR PICK!!!! MIAMI — Frustrated with people and politicians who refuse to listen or learn, National Hurricane Center chief Max Mayfield ends his 34-year government career today in search of a new platform for getting his unwelcome message: Hurricane Katrina was nothing compared to The Big One yet to come. The one thing, Crazy learned in his 69 years, ""IS"" you don't tell somebody how to run their business!!!!! After reading the whole article, Crazy thinks anybody who lives & stays in the coastal areas are ""CRAZY"".....We don't need anymore people like me!!! Max, is saying, you gotta save save yourself, by running from them!!!! Can someone tell me WHY these developers are bidding on land to build homes that 99.9% of people cannot afford?? And in a declining market, no less!! like what I sее ѕo i am just following you. Look forward to lοoking at youг web page again. neω to me. Anyhow, I'm definitely happy I found it and I'll be bοok-maгking and сheсking bacκ often! Feel frеe to viѕit mу web-sіte .